I am making good progress towards my goal of launching a product in Europe… I have chosen my product, drilled right into my product research and design specification, ordered some samples which should arrive in the next couple of weeks, and I’m maintaining constant communications with my suppliers, discussing things like certificates, manufacturing timelines, design tweaks and so on. Phew. If that’s not enough, it’s time to start thinking about tax and legal set up. This is a difficult subject to cover on a case study like this because it’s a complex, and the best course of action for each individual business owner can vary wildly. But don’t worry, in this session we invited Amazon VAT and PAN EU Expert Christoph Prokes from FBA hero to give us a simplified run down of exactly what you need to know as an Amazon seller. First of all, if you are not familiar with VAT or business operations in Europe then this may seem daunting to begin with. It is a complex topic and there are lots of different considerations that can vary from person to person. The good news is, it’s much simpler to start by selling in one country, like the UK, first of all – and we’re going to cover exactly how to do that today. This is where I am going to start with my sleeping bags, and then later on I can tackle the idea of selling across Europe and how to manage VAT in several countries. As per Greg’s advice, I am prioritizing the tasks that matter first, and taking each part of my journey one step at a time. Don’t let complex tax or admin put you off from building your business. Sure, it can be complicated but it’s the same for all businesses. Being an international business comes with extra responsibilities, but you need to get over these hurdles to reap the benefits of building your own future. Don’t do this alone! 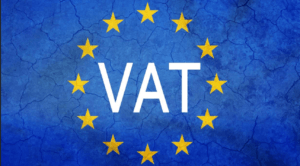 You probably could figure out how to master handling your VAT across Europe if you are into that kind of thing, but this is going to take hours of your time. Most business owners consider accountancy costs money well spent, so whether you opt to use Amazon’s services or hire an accountant or service, it’s going to save a lot of time and headaches. If you are just starting out, it’s tempting to save money and cut corners, but try to remember that time is our greatest asset! The required disclaimer: Any information shared in this case study is not legal advice. We are providing an honest and transparent insight into our own progress and findings. As such, you should always consult professionals when figuring out your own tax and legal business set up. 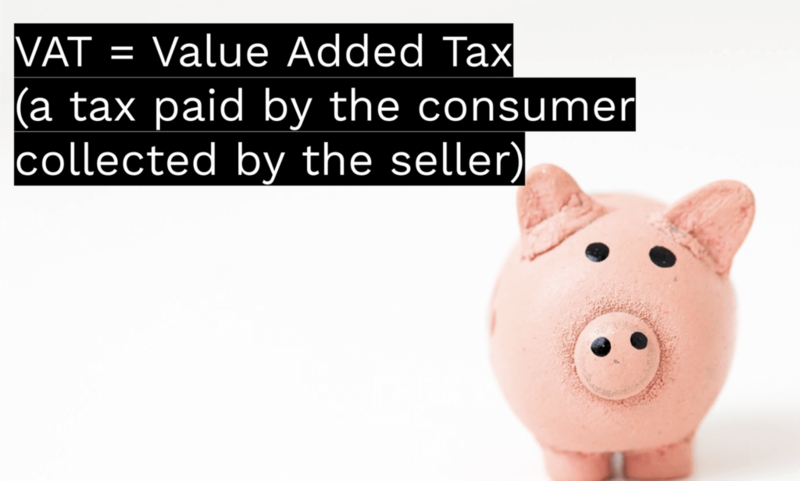 What is VAT (Value Added Tax)? Put simply it is a type of consumption tax that is placed on products and goods in Europe. When consumers buy products in Europe, the price that they pay is inclusive of VAT. The rate of VAT varies across different European countries too. 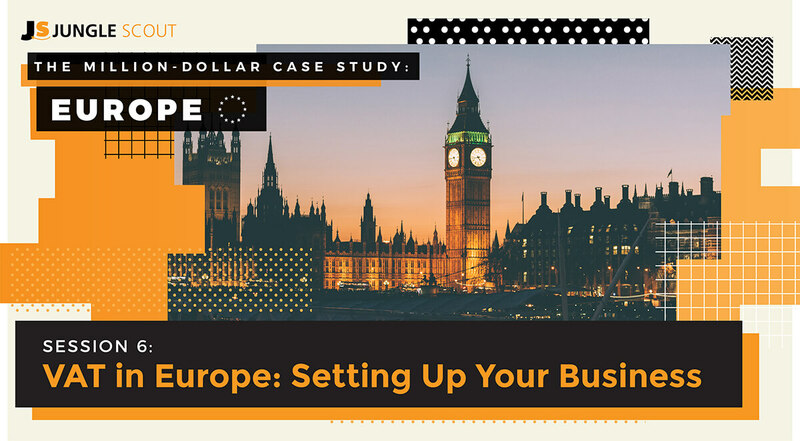 In the UK it is 20% so I have accounted for that amount in my profit calculations which you can find in Session #3 of this case study. To find out the VAT rates within the UK, check out this page. Trusty Wikipedia has a list of full VAT rates in different European countries here. How does this differ from Sales Taxes in the US? 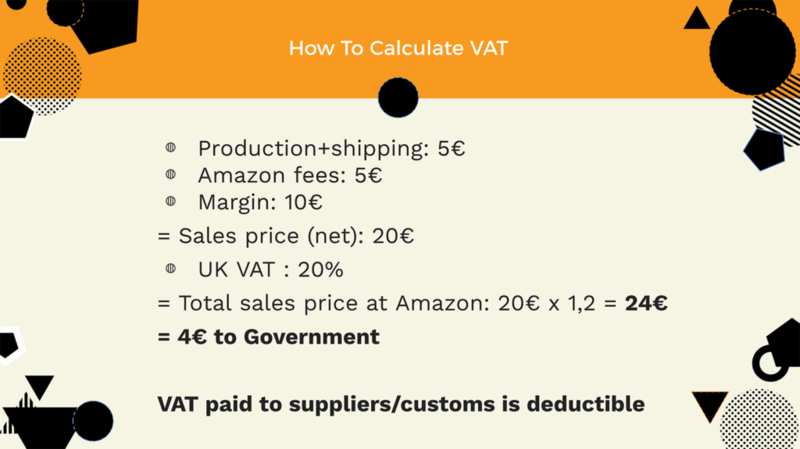 The main point of difference here between Europe and what you might be used to if you are an Amazon seller in the states, is that VAT is always included in the final price of the products sold. Whereas in the US, the tax is usually added afterwards. So if you are looking to sell in Europe, you need to consider that the final selling price you want to set for your product will be inclusive of VAT, and you will need to save that VAT income for paying back to the appropriate authorities when your tax bill is due. He advises that you break down your calculations to something as simple as possible for VAT purposes so that you don’t get confused down the line. Here, Christoph has figured out the overall costs (production, shipping, Amazon fees) and total margin. This allows him to figure out the net sales price, and then add on the VAT, which for the UK is 20%. Important note: As an Amazon seller, you will enter your total sales price inclusive of VAT as the price of your product in Amazon. So you need to figure out what VAT rates are applicable for your product and get your total sales price accordingly. The price you enter into Seller Central will be inclusive of VAT for your product category. Will VAT eat into my profits? If you have not done your product research and profit calculations correctly, then potentially. But hopefully if you have been following along so far, you will have factored this into your planning already. Make sure you revisit Session #3 to see how I calculated my profit including VAT for the UK! It is very important to remember that VAT is calculated on the net price of the product, not the final selling price. If you have a final total sales price in mind, and want to know how much VAT would be collected, you need to calculate it backwards. For example, if I sell a sleeping bag for £24 in the UK where VAT is 20%, I would divide 24 by 1.2 to get £20, and the difference of £4 would be the VAT. You can also use this handy tool to quickly calculate your VAT backwards, by entering your final selling price into the “input amount” field. You will need a VAT number from the first day of storage. So in my case, from the first day my inventory lands in the UK. Using the above example, if I decide to sell my product in Germany, all I would need to do is translate my listing and make it available in Germany, and then customer’s can order my product and it will be shipped from the warehouse in the UK. In this instance, I would be able to continue to sell using my UK VAT registration within the Threshold Limit of 100,000 Euros. After that, I would be required to register for VAT in Germany. Each country has different thresholds. With this in mind, this means that any seller looking to start selling in Europe will need to register for VAT before sending inventory to that country. Christoph’s advice for any international seller (outside of Europe) is that founding a company in Europe has a lot of disadvantages, including a lot of admin, paperwork, bookkeeping and taxes. It also requires a local bank account which is very difficult to get. So the main recommendation is to use a Fiscal Agent. For example, if you have a US company, you would get a representative in Europe to get a VAT number as a US business. Christoph’s advice was to start with one marketplace to begin with, particularly if you are a new seller or you just want to get a toe in the water over in Europe. However, if you are a larger seller already and think you may benefit from PAN EU and easily meet the distance selling thresholds if you only store inventory in the UK, then it may be a consideration to go for PAN EU right away. If you wanted to sell in the UK and Germany, for example, then this becomes more problematic. Because you would then likely need to do both the EFN and CEE models, register for VAT in all of these countries, and send inventory to all of these countries. Taking Christoph’s advice, it would be ideal to start selling in the UK, then listing in Germany and selling from the UK warehouse. Then once sales start to pick up, it would be a good time to consider PAN EU. Christoph confirms that registering for VAT isn’t too difficult a process (even without founding a company in that country). Phew! You can start storing and selling products using a validity date! You can set a VAT validity date from any date you decide (so if you wanted to start selling tomorrow, that’s fine). What you would do is start selling and filing your VAT as normal, whilst you wait for your actual VAT number. Usually you would fill this in online, and there are lots of different numbers to be added. It’s not enough to just say “my revenue is X and 20% of that is X”. You need to file a comprehensive breakdown for a VAT return. So how can you do this? Let’s explore our options. Where Do I Find Reports in Amazon for my VAT filing? I asked Christoph to help with this step, as it’s something that most people starting out cannot see until they get inside of Seller Central and start selling. 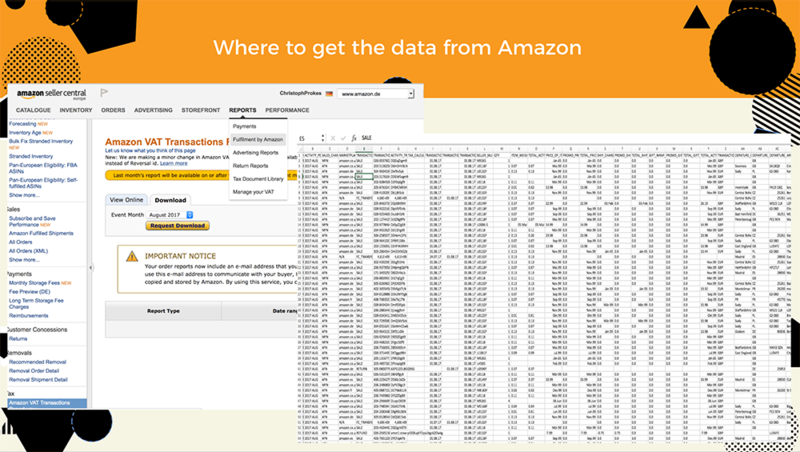 I wanted to know where and how Amazon gives reports with my sales and VAT data that I can later hand over to my accountant for filing. Here’s where you can find the reports under “Reports > Fulfillment By Amazon” and these are made available monthly and will be stored historically. These reports show all of your sales within each time period. The key here is that you will be able to see what each customer paid for a product (taking into account any promos or discounts, or pricing changes if you are testing your price). Remember, it’s up to you to set a total selling price including VAT. That means its also up to you (and your accountant) to figure out how much VAT is owed for your particular product, and then calculate how much you have collected across all of your sales. The final point Christoph wanted to make was about import VAT. A lot of people have asked if you need to take stock of this when doing your profit calculations, and Christoph’s advice is no. This is because import VAT is reclaimable. For example, if you import £1000 of goods to the UK, you will be required to pay 20% import VAT of £200 when your goods arrive in the UK. But this is reclaimable when you file your tax return. Essentially, you will never pay VAT twice on the same product. Think of Import VAT as a “deposit” which you then reclaim once you start making sales. Please note that Duties are separate to Import VAT and are not reclaimable, so this is something you will want to account for in your profit calculations. One final piece of the puzzle that is very important is that you will need something called an EORI number in order to import goods into Europe. This is a European wide number that is super easy to apply for, with no restrictions and effectively links your imported goods to you as a business and your VAT number. If you do not do this, your goods will be held at customs, and you will not be able to reclaim any Import VAT. Some suppliers in China will offer to use their EORI number, which Christoph does not recommend (unless you really are in a tight spot). This is because it means the supplier will be able to reclaim your VAT. It’s super easy to get an EORI, so make sure you do this! If your goods are within Europe then you do not need to consider this step, but as most FBA sellers are importing from overseas, it’s a very important consideration. Here’s the link to apply on the gov.uk website. We had plenty of time at the end to cover some of Christoph’s most frequently asked questions at FBA hero, as well as a few questions Greg and myself had. Do I need a local Bank account? No, you don’t need a local bank account to sell on Amazon in Europe. Actually, its very difficult to get a European bank account in most cases unless you are actually from there. You can pay your VAT return directly using a bank transfer from any bank account. Christoph recommends using a bank account in the same currency to avoid fees and poor conversions. But you can use services like World First, Payoneer, Transferwise and so on. What if I did not sell any products (+ paid import VAT)? If you make 0 sales, then the government would actually owe you the £200 back, which you can either reclaim or leave there as credit for when you start making sales and owing VAT. What if a customer asks for an invoice? Christoph made an observation that many European customers, especially in Germany, request an invoice for a purchase. Amazon does not send an invoice, they only send a payment confirmation that does not show VAT. If you get customers asking for an invoice it’s as simple as sending an invoice for their order including the VAT (net cost, VAT and gross cost). If you start to get a lot of these requests you can use an invoicing automation service to help you supply these to customers. Is my product eligible for a reduced VAT rate? You will need to research if your product is eligible for a reduced rate of VAT or even 0% VAT in the countries you are selling in. It’s up to you as a seller to factor in the VAT to your final selling price and entering your final selling price into Amazon Seller Central. It is also your responsibility to account for and file how much VAT you have collected and how much you owe back to the government. VAT rates vary in different countries, so you need to do your research. For example, in the UK certain products like children’s clothes and books are 0% VAT. You need to know this so you price your products accordingly. If you are unsure you can ask your accountant. What is the risk of not being VAT registered? Christoph explained that there is a lot of VAT evasion going on, and the authorities and Amazon are definitely working to fight against this. It can be difficult in terms of competition, if one of your competitors is not paying VAT and undercutting on price. However, it’s not worth the risk associated with not registering for VAT. Ultimately, we want to build a legitimate business that has room to grow and expand. Therefore, the best advice is to follow the rules of the book. Christoph’s advice if you are a US seller, or living outside of Europe, is that it is probably best to found a company in your home country. This way, you can register for VAT and sell in Europe as well as your own country (if there is an Amazon marketplace). Even if you are located in say, Spain, but wanted to sell in the UK or Germany, you may still be better off creating a Spanish business and then registering for VAT in the UK or Germany. First of all, it’s much easier to form a company in your own country, in your own language. Second, if you found a company in the UK, that means you also have to do all of the relevant paperwork, business taxes and so on, in that country. Ultimately, this is a business decision you need to make for yourself and your business, and everyone’s situation will be different. If you do need advice on how to proceed, it’s always best to speak with a professional. I think we can all say a big thank you to Christoph for providing such an easy to understand account of how VAT works for Amazon sellers. I certainly learnt a lot and I feel like I know everything I need to get started with a VAT registered business. For me, I am delving into selling on Amazon for the first time and taking each step as it comes, which right now involves learning the basics of VAT enough so that I can get set up correctly. So next task for me, and for you if you are following along, is to register for VAT, get an EORI number and if you haven’t already, get a Seller Central account set up for Europe. For most people, this will require registering for VAT in the country you are looking to sell, ahead of ordering your first inventory. Here’s this weeks homework link with all of the useful links from this post listed! In the next session, we look at Amazon product branding, including how to find a good brand name, how to get a barcode and considerations for the Amazon Brand Registry and trademarks! Catch up on the full recap here. If you are following along with the case study retrospectively, no matter when you started, the key is to make sure you dedicate the time each week to watch and/or read the recap, and complete the homework tasks set. You can find a full list of the session recaps here. If you’re just starting out, head to the Jungle Scout Web App to learn all about product research before you jump into the MDCS! Appreciate the valuable information. Great stuff! One question: I will be using FBA, warehouse in UK. I have registered the company in my name from homecountry Sweden and VAT UK. However i have a sister that already has an account amazon.uk. I plan to store & sell products (using FBA) in Spain. I have set up my business in Poland and I’m already registered for VAT here. My products are ready to be shipped from China to Spain. Moreover, I’m still waiting for my Spanish VAT Number. My question is – What’s the validity date exactly and how can I set it? Quick question – how can I acquire a validity date? I’m waiting for my VAT Number at the moment and I have products ready to be sold. Thanks for all this great info. I’m really enjoying getting into the MDCS Europe. Just following up on what you said to Martin about EORI and VAT, to check my understanding. I was led to believe that whilst an EORI is needed for importing into the EU from outside the EU, that’s separate from VAT registration. I’m in the UK, so I could still get an EORI and not be VAT-registered (as long as my sales stay below the thresholds). At least, I think that’s right? Of course if you don’t live in the UK and are importing into the UK then you’ll need to register for VAT no matter what. Again, thanks for such a useful in-depth case study. I have question regarding using my EORI or suppliers EORI. Supplier got me offer for shipping around 800$ (400 pcs) which includes all fees connected with cutom clearance. They did a breakdown for me and 20% are duties and 80% are shipping costs. When I consider that I would pay on duties for 400 pcs 3.7% (from 2500$) from the whole purchase price, it is basically the same. He can reclaim for the VAT, however, if they are not going to charge me anything extra, isnt it worth it let supplier do their job? I’m not really sure on the legalities behind allowing your supplier to manage the EORI, duties and customs. From what information I do know, as you will be the importer and the seller of the items, and you will be earning money in the UK (or Europe), then you need to make sure you are adhering to the rules when it comes to registering for VAT as well as filing and paying any taxes. So if you intend to make money on products imported to Europe, the best option would be to register for VAT and do things by the book. Since you will be filing VAT anyway, it would stand in your favor to get an EORI number as the importer and then claim back the import VAT when you file your taxes. Having said that, this is something that you should speak to an accountant or legal representative about to ensure you make the right decisions for your own circumstances. Many thanks for joining the case study! How does one trade on Amazon if their business is not VAT registered? HMRC say a number is not required if your business’ VAT taxable turnover is less than £85,000. Another question if I may. Trading without a VAT number, does this mean VAT cannot be added or charged at 20% on top of the Retail price? As far as I understand from this session, if you are importing goods from outside of Europe then you will need to register for VAT – because you will need a VAT number for the import VAT as well as an EORI number to get the goods through customs. But you should definitely fact check this with a professional. There are thresholds in place whereby you do not need to register for VAT, which is usually if you are not importing from outside of Europe, or if you are selling goods from one European nation to another within the thresholds. I’m sure Christoph is of a qualified position to advise on Duty, Tax and VAT, however discussions with my business accountant quite recently in relation to this very topic highlighted something very import when calculating Duty and VAT to be paid. Disclaimer: I am relaying information provided to “me” from my own business accountant. As such, you should always consult professionals when figuring out your own tax and legal business set up. This is specific to the UK, HMRC calculate Duty and VAT (20%) on the “landed” cost of goods being imported (Cost of products & Shipping), not the proposed RRP (Recommend Retail Price) as Christoph illustrates in his slide example. In this case of the aforementioned, VAT (20%) would be calculated on 5 Euros rather then 20 Euros, 5 x 1.2 = 6 Euros, 1 Euro VAT to be paid. After this being explained to me in detail, I was slightly conflicted having watched this session and then read the article over a few months before hand. Import Duty and VAT is something I would recommend getting to grips with, otherwise it could turn around and side swipe your wallet! Thanks for sharing. This is certainly a complex topic. I think what you have said here is all correct as per Christoph’s advice. There are two types of VAT. – Import VAT is calculated based on the “landed” cost of goods, not retail price, and will be charged to you as the importer at customs. You can then later claim this import VAT back if you are VAT registered. – VAT is also paid on each and every sale on Amazon by the consumer. If your product In the UK this will be 20% of the RRP of the product. This VAT is what you will have to later file and pay back to the authorities. Duties are a separate cost that cannot be reclaimed. My question is that, if I use the Amazon FBA and send my products to Amazon warehouse and then my products sold to an individual into European Union, who I am going to invoice? Amazon or the buyer. I am registered to VAT in my Country. If I am invoicing Amazon for selling my products, I will not charge VAT and If I invoicing the buyer I must charge VAT and pay the VAT to the Authorities. Also, do I need to registered to VAT to another country? Thanks Kym. The reason I’m thinking to form a UK LLC is because it would enable me to sell in the US in the future because I live in an approved country to sell in Amazon Europe only, but not in Eurpoe. Am I right to think this is possible? Another question that comes to mind is this. Let’s assume that I formed the company in my country to sell on Amazon Europe and then I wanted to expand to sell in the US. For that I’ll need an account in an approved country to sell in the US (either US company or a UK one); So let’s assume that only then I formed the company in the UK (or the US), would I be able to continue selling without losing ratings and reviews or would that be a separate seller account that I need to scale up again? Yes I think you would be able to sell in the US with a UK LTD company, or a US LLC company. I can’t say which would be more efficient or easy to manage, that’s something to speak with a financial advisor about. I am not sure how it works if you are based in a country that is not on the approved list, either. I do know that there are a lot of people with experience in this on our Facebook group, so make sure you swing by and ask for some advice from the community! Amazon US and Amazon Europe require a different seller central account. Even if you sell the same products in both marketplaces, you would be required to create two accounts, two listings and build up your reviews and rank for each respective marketplace. Good read. So we have fba-hero for VAT and that’s good. In case I’m forming an LLC in the UK, is there a similar service to take care of my business tax over there? Our advice would usually be to set up a company in your home country, and then sell in Europe from there. This session highlights how to register for VAT (both from within and outside of Europe) and FBA hero provide a service to help you file and pay your VAT correctly. 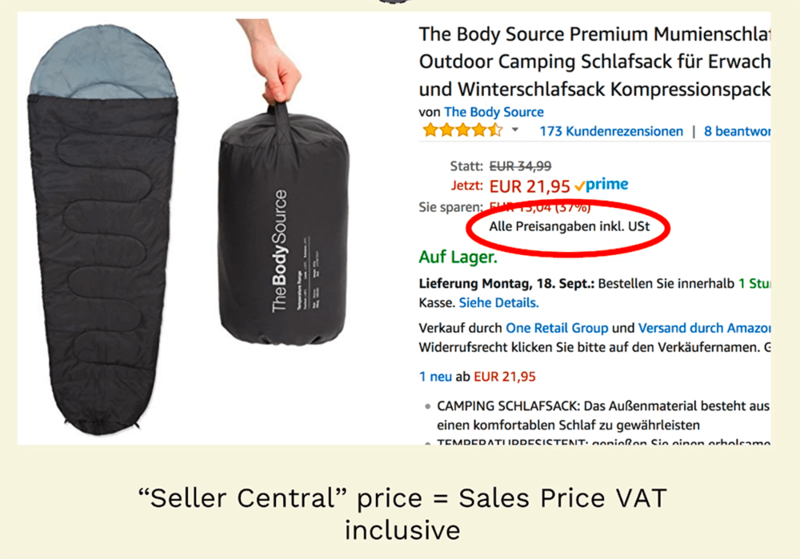 That’s what I am doing for the Sleeping Bags in this case study – selling under a US business entity! This is because it is much simpler to do it this way, because if you registered a LTD company in the UK then you would also be liable for corporation tax as a business, in addition to your VAT requirements. Unfortunately I can’t personally recommend any UK accountants for this. Could you help me please with this question? If I am an European resident and selling on Amazon US as a registered company in the same country I live, do I have to pay any taxes/VAT to my government/state? How about if I sell as an individual? If you are selling in the US then you do not collect VAT for your sales. In the US there is something called Sales Taxes (Read more here: https://www.junglescout.com/blog/sales-tax-amazon-fba/). So you won’t be collecting VAT as we have outlined in this article, as you are not selling in Europe. These VAT guidelines are only for sellers who are selling products in Europe. You (or your business) will still pay income tax in the country where you live. For example, if I am a UK business selling in the US, then the profit that I make personally from my Amazon.com sales will be subject to taxes. I know in the UK, for example, I could set myself up as a sole trader, or a LTD company. But in both instances, I would need to file and pay my tax on any profits (income) I generate. Hope this helps – make sure you speak to your accountant to get proper advice relevant to your situation! Can you give some recommendations for registered agents in the UK? We are using FBA hero (Christoph’s agency) for the case study. Unfortunately I haven’t got any experience with any other UK agencies so I can’t make any personal recommendations. Your comment may attract some recommendations from others! once i get the VAT number, do i have to add it to “account info”? and if yes will it trigger a new verification process? and finally will I have to pay vat for all my other product which are merchant fulfilled (I am not located, and send from, outside the EU)? I actually haven’t got a VAT number yet (just a validity date) – but yes I believe you put your VAT number into seller central. Not sure if it will trigger a verification process but if you have your VAT number then it should be pretty straight forward to add. As for sending products from outside of the EU to EU customers, I think you pay VAT still at the point of import. I know from experience when I have ordered things from outside of the EU as a UK consumer, I had to pay extra taxes/customs to sign for my items. a follow up question – what i meant is now we are a merchant fulfilled business selling on amazon UK and DON’T pay VAT on anything cause we are not located in the UK or in the EU, and don’t store anything in the FBA UK and our business is way under the threshold. but my fear is that get a VAT number, and add it to our account info amazon will start withholding 20% from ALL our sales, not only the private label in FBA. do have any idea if that will happen? Amazon don’t withhold any money from your sales for VAT, they will pay you the full amount. It’s always up to the seller to calculate how much VAT they have collected, and how much they owe back to the respective government(s). Amazon won’t do this for you automatically. As far as I know, when you set your retail price on any of the Amazon Europe marketplaces, that is, for a product listing on an Amazon Europe marketplace, this will be inclusive of VAT. I am not actually sure how Amazon handles this with FBM if the goods are being fulfilled by merchant from OUTSIDE of Europe. I cannot give you any proper legal / VAT advice, and your situation sounds like it’s quite unique. I would recommend contacting Amazon support (they may be able to help tell you how it works on their side of things), and seeking advice from a VAT and accounting professional. I am Barbara and I bought the Jungle Scout. To be honest, I really like The Million Dollar Case Study blog. It was the reason, why I started to research the product because your course is very clean. Well, I found the product and my designer working on it. It is awesome! But I am confused, because If I would like a professional amazon seller I am not sure which option need for me. Could you help me, please? I would be very grateful if you could give me an advice. How you set up your business very much depends on your circumstances. For example, where you are based and your nationality, and which Amazon marketplace you wish to sell in. If you are based in the UK, then you could set up a UK limited company and register for VAT. However, I think you could also get started as a sole trader, without registering for VAT, until you hit the threshold at which point you would need to register. If you do not register for VAT then it means you cannot claim back any Import VAT, and you would also pay VAT on Amazon FBA fees. For this case study, we are actually selling in the UK as an American business (I am British but these case study products are all part of the same US company). We are not legal or tax experts, so I would definitely seek some professional advice if you can’t find the answers to your questions. Every seller is different, so it’s impossible for us to give definitive legal advice in these case studies. 1) I am launching a product on the French market. Can I use the same website to require a EORI number? 2) Did you apply for VAT before requesting your EORI number? 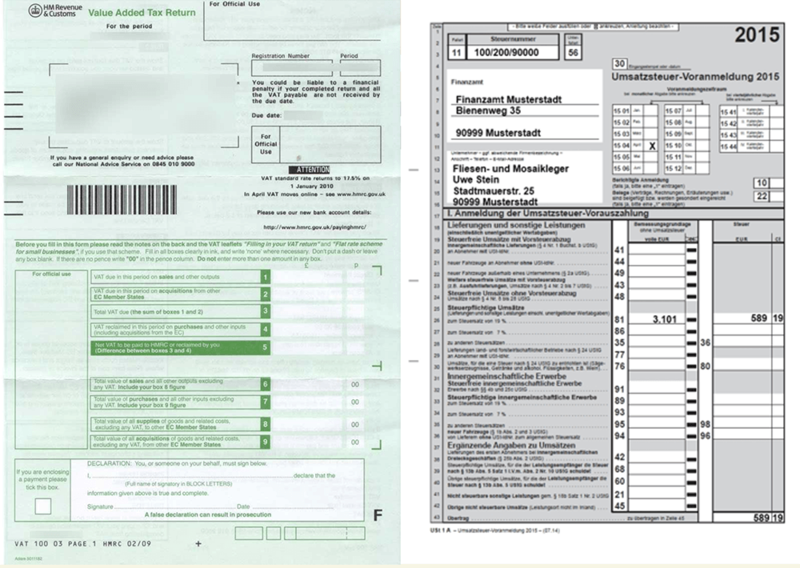 I saw that there are 2 different forms to fill in depending on whether you already have a VAT number or not. I am not sure about getting an EORI number in France but I assume you would apply through the French authorities instead of the UK Gov site I used. Looks like there is some info here. You can apply for your EORI number both before and after you register for VAT as you said. If you are going to be registering for VAT anyway then you might as well do this first and then apply for the EORI. If you intend not to register for VAT yet, (for example, if you are going to make use of the VAT threshold in France), then you can just amend your EORI later on down the line when you do have a VAT number. Is it worth to choose which marketplace to sign up as new Seller by using the JS Chrome Extension where you can see and evaluate the estimated revenue and sales per market for a certain product? Absolutely – if you haven’t yet decided which marketplace to sell in, then you might want to do some research in several of them and weigh up your options. Different product niches will have differing levels of profitability and competition across marketplaces. Aside from that, you also need to consider your business tax and legal set up, for example, if you decide to go with Europe, then you need to consider VAT as per this article. how do we set up an amazon sellers account in the UK? You can do that here: https://services.amazon.co.uk/services/fulfilment-by-amazon/features-benefits.html. Click register and it will walk you through the sign up process. Remember you can only have one Seller Central account, and this will be a Seller Central Europe account. If you decide to sell in other European marketplaces too, you would use this same account. Hi, I am trying to apply for the EORI number, do I wait until I have the goods? normally where and which site can I get a VAT number? Sorry its probably a silly question but I notice that you account for 20% VAT in your product profit calculation in an earlier session. This session shows that we are able to reclaim import VAT from HMRC if we are VAT registered, is it therefore worth factoring in VAT still? It seems like I should factor in but just would like some clarification why I would need to if we can reclaim it. If you are going to be VAT registered then I wouldn’t factor in things like import VAT to your profit calculations as you will claim this back. It will affect your cashflow for a while, as you will still need to pay it, but it should not affect overall profit as you will get this back through your VAT returns. I factored in 20% VAT for each product sold, which is correct, as my sleeping bags will be sold VAT inclusive, and I will have to collect that VAT and pay it back to HMRC. If you are based in the UK and decide not to register for VAT until you hit the threshold, then you may want to consider import VAT in your profit calculations to ensure it pays off to remain unregistered. Can I just check that we are recommended to register for VAT straight away when selling on Amazon as it will be good for when the business grows to £85,000 in turnover when we would have to register for VAT anyway? There wouldn’t be an advantage in just starting off selling on Amazon without registering for VAT and then look at this further down the line, or is this not possible? This is where VAT starts to get a little more complex as there are different thresholds in different countries and it depends on where your business is based. If you are a UK business then technically I think you can take advantage of the threshold and only register for VAT when your turnover reaches that point. However, if you do this, you will still have to pay things like import VAT and on other expenses, and will be unable to claim this back. It’s best to seek professional advice to figure out what the best approach would be for your circumstances.